On September 12th, The Conference of Regional and Local Authorities for the Eastern Partnership (CORLEAP) held its 7th Annual Meeting in Brussels. Discussions were focused on the need to strengthen the role of local authorities in implementing the EU Joint Staff Working Document EaP – 20 Deliverables for 2020 in the field of good governance and energy efficiency, as well as the activities of STRATCOM in the EaP Countries. 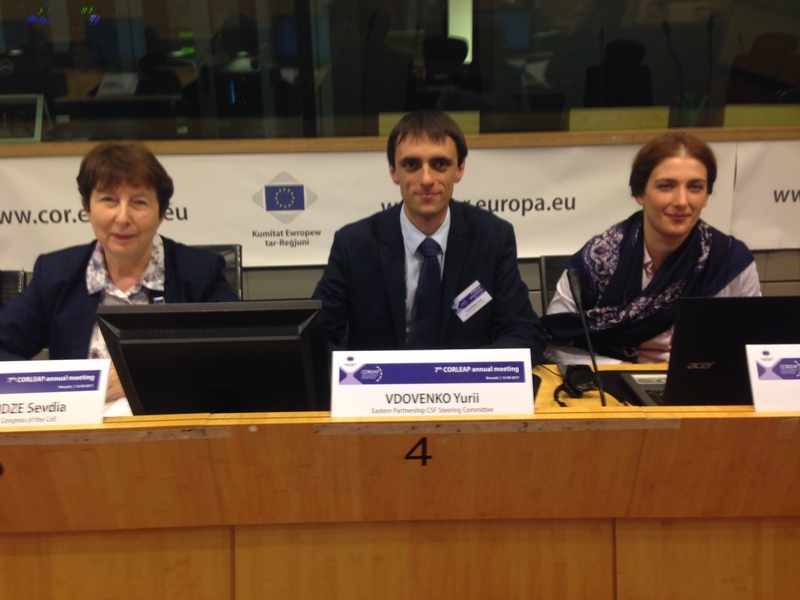 Steering Committee Member Iurii Vdovenko took part in the meeting as a representative of EaP CSF and had the chance to stress the importance of civil society’s role for the achievement of an efficient local governance, as well as to present the EaP CSF Analysis of the 20 Deliverables for 2020. Former president of Moldova Marian Lupu described the priorities of the EURONEST Parliamentary Assembly, highlighting the need for better coordination among different components of the EaP architecture, including CORLEAP and EURONEST, as well as for cross-sectoral cooperation. Lupu also highlighted the need for a clear European perspective for those countries having signed the Association Agreement with the EU. Director of “Neighbourhood East” (DG NEAR) Lawrence Meredith outlined the four EaP priorities: governance, economic development, connectivity and people to people and acknowledged the role of local and regional authorities in policy design, delivery and contact with citizens. Meredith referred to local economic development, cooperation between local authorities and civil society on improving the business environment and energy efficiency. Boris Iarochevich, Head of Division at the European External Action Service (EEAS), stressed the inclusive nature as a fundamental feature of the Eastern Partnership, stating that the region presents common challenges and shared long term interests. Iarochevich affirmed that the Summit Declaration would welcome the role played by local and regional authorities through CORLEAP in advancing the EaP objectives at the level of governance closest to the citizens. He furthermore referred to further associating CORLEAP to the work of EaP platforms and panels. In his speech, EaP CSF SC representative Iurii Vdovenko referred to the Civil Society Declaration to the Summit as a collaborative document identifying major obstacles to further democratic development within the EaP countries and to the smooth implementation of the 2020 Deliverables, while including recommendations on how to overcome them. The Steering Committee member also made reference to various points included in the Joint Staff Working Document, especially focusing on new job opportunities at the local and regional level, rule of law, anti-corruption mechanisms and public administration reform. Vdovenko further stressed the role played by civil society organisations within the Eastern Partnership countries, as well as the need to identify better ways of cooperation between civil society and governments, in order to deliver effective results to the citizens of the region.